Herbs and spices are rich in antioxidants, and a new University of Georgia study suggests they are also potent inhibitors of tissue damage and inflammation caused by high levels of blood sugar. Researchers, whose results appear in the current issue of the Journal of Medicinal Food, tested extracts from 24 common herbs and spices. In addition to finding high levels of antioxidant-rich compounds known as phenols, they revealed a direct correlation between phenol content and the ability of the extracts to block the formation of compounds that contribute to damage caused by diabetes and aging. “Because herbs and spices have a very low calorie content and are relatively inexpensive, they’re a great way to get a lot of antioxidant and anti-inflammatory power into your diet,” said study co-author James Hargrove, associate professor of foods and nutrition in the UGA College of Family and Consumer Sciences. Hargrove explained that when blood sugar levels are high, a process known as protein glycation occurs in which the sugar bonds with proteins to eventually form what are known as advanced glycation end products, also known as AGE compounds. The acronym is fitting because these compounds activate the immune system, resulting in the inflammation and tissue damage associated with aging and diabetes. The researchers found a strong and direct correlation between the phenol content of common herbs and spices and their ability to inhibit the formation of AGE compounds. Spices such as cloves and cinnamon had phenol levels that were 30 percent and 18 percent of dry weight, respectively, while herbs such as oregano and sage were eight and six percent phenol by dry weight, respectively. For comparison, blueberries – which are widely touted for their antioxidant capabilities – contain roughly five percent phenol by dry weight. 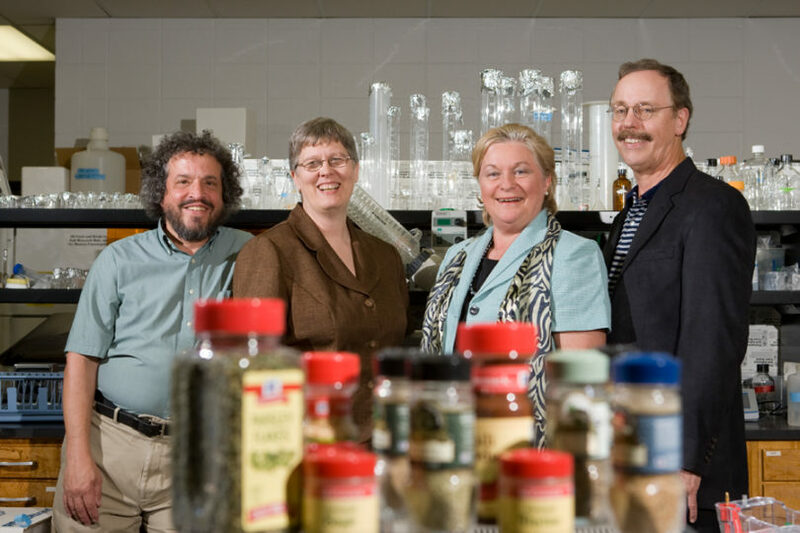 Study co-author Diane Hartle, associate professor in the UGA College of Pharmacy, said various phenols are absorbed differently by the body and have different mechanisms of action, so it’s likely that a variety of spices will provide maximum benefit. “If you set up a good herb and spice cabinet and season your food liberally, you could double or even triple the medicinal value of your meal without increasing the caloric content,” she said. She added that controlling blood sugar and the formation of AGE compounds can also decrease the risk of cardiovascular damage associated with diabetes and aging. She explained that high blood sugar accelerates heart disease partly because AGE compounds form in the blood and in the walls of blood vessels. The AGE compounds aggravate atherosclerosis, which produces cholesterol plaques. The UGA researchers tested for the ability to block AGE compounds in a test tube, but animal studies conducted on the health benefits of spices lend support to their argument. Cinnamon and cinnamon extracts, for example, have been shown to lower blood sugar in mice. Interestingly, cinnamon lowers blood sugar by acting on several different levels, Hargrove said. It slows the emptying of the stomach to reduce sharp rises in blood sugar following meals and improves the effectiveness, or sensitivity, of insulin. It also enhances antioxidant defenses. Hargrove said their findings suggest it’s likely that the herbs and spices they studied will provide similar benefits in animal tests. He points out that because humans have been consuming herbs and spices for thousands of years, they come without the risk of possible side effects that accompany medications. Study co-author Phillip Greenspan, associate professor in the College of Pharmacy, noted that most people don’t get their recommended five to nine servings of fruits and vegetables a day. Rather than seasoning their food with salt – which provides no beneficial phenols and has been linked to high blood pressure – he recommends that people use a variety of herbs and spices to help boost the nutritional quality of their meals. “When you add herbs and spices to food, you definitely provide yourself with additional benefits besides taste,” Greenspan said.